As the only Government management Institute, RIM has been solely engaged in supporting the human resource development need of the country, especially for the civil service. RIM’s intervention in the national human resource capacity building was primarily through training, research and consultancy activities. Supporting the private sector development through niche training interventions in support of their human resource development initiatives. Generate revenue to support future sustenance, provide incentives for faculty & attract high expertise. Build the profile of faculty through increasing academic qualifications at the Masters and PhD level, and by attracting international faculty. and shall not waver in our loyalty to the Institute and Tsa-wa-sum. by emerging our collective wisdom and talent. We shall from any activities that would be in conflict with the interest of the institute and Tsa-wa-sum, and shall be accountable for our words and actions. The Board of Directors headed by a Chairman appointed by the Royal Government provides leadership and strategic directions including policy guidance. The Board is supported by the Secretariat headed by the Director of the Institute appointed by the Royal Government. The Director is responsible for the day-to-day management and administration of the Institute and formulation of strategic policy proposals for consideration by the Board. A Policy & Planning/Communication Unit supports the Director. The Unit is headed by the Chief Planning Officer. 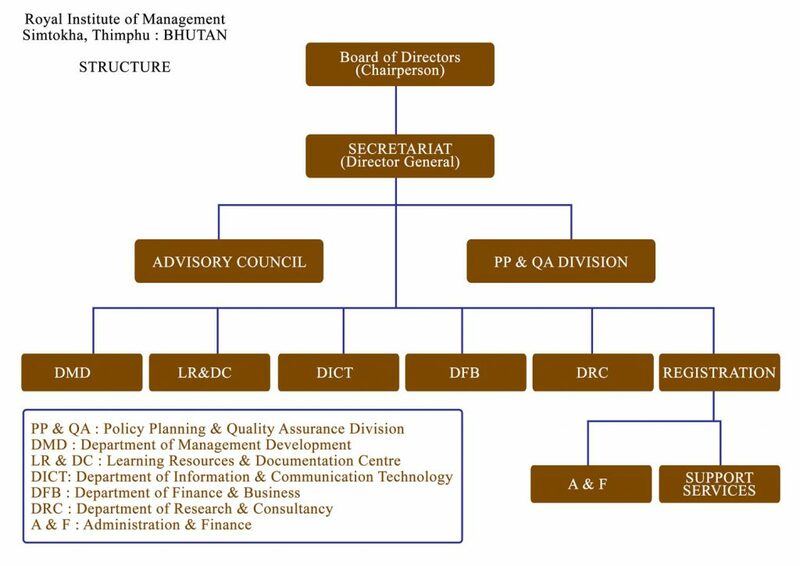 Besides the Policy, Planning & Quality Assurance, and Advisory Council, the structure is broadly divided into two functional areas viz. Programme and the Registration. The programme service is responsible for the discharge of academic services. The Registration supports the programme and is responsible for the general management,administration and provision of learning resource facilities. The new structure has five departments with Department of library Services being the lastest department. Departmentalizing provides focus of the programmes based on their broad grouping and specialization. A Department has the option of adding centres under its administrative jurisdiction to meet certain specialized programme needs. Located seven kilometers at the outskirt of the capital city of Thimphu,the institute is situated below the oldest Dzong of Bhutan,the Semtokha Dzong (fortress). Overlooking the institute, we have the Buddha statue (Kuensel Phordrang) on the west and the Ola Rongchu (river) flows through its 25-acre campus that adds to the serenity and the natural beauty of the campus. The Institute houses an auditorium with a seating capacity of 210,a Temple / Lhakhang and sports facilities including a gymnasium. The training activities are conducted in its ten classrooms,seven computer laboratories, and three seminar/conference halls. The residential block comprises hostels with an intake capacity of 200 trainees and 14 units of residential quarters for faculty and ten for administration staff wifi connectivity facility. In order to support the academic activities, the Library houses a total collection of over twenty six thousand plus books, twenty seven subscribed journals, nine hundred ninety four audio visual materials, five thousand National and International reports in the fields of Management, Computer Science, Social Science, Philosophy, Language, Literature, History and Religion. The library is fully automated using KOHA software and provides access to the online catalogue of Library on Intranet and Internet. DSpace software and it can be accessed on Intranet. RIM Library has subscription to Proquest. ProQuest multidisciplinary, fulltext database and this resource provides access to almost 40 of Pro-Quest’s complete databases, with a variety of content types across over 175 subjects, making this the broadest single research resource in the world. We are also a member of Developing Library Network (DELNET) is a major Resource Sharing Library Network in “South Asia”. DELNET also provides inter library loan for books, and document delivery services for journals articles to the Member libraries within and outside India. We also have free access to millions of unlimited books on e-pdf drive. RIM also has one of the biggest Multipurpose Hall in the country that can accommodate around 2000-3000 people and has provision for an indoor basketball court.